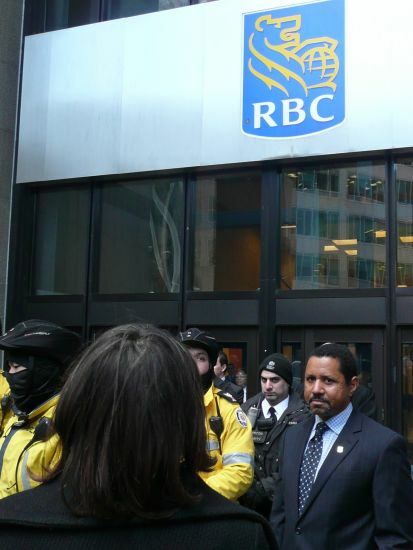 TORONTO - Dozens of people gathered outside the Toronto headquarters of the Royal Bank of Canada (RBC) and Jarislowsky Fraser Limited (JFL) today to present the companies with letters of warning. "This letter is to issue a warning of trespass to those companies associated with the PTP [Pacific Trails Pipeline] industrial extraction project and against any affiliates and contractors infringing upon traditional Wet'suwet'en territory." The letter is signed by Freda Huson, a spokesperson for the Unist'ot'en, a clan of the Wet'suwet'en nation. RBC and JFL are the largest investors in Encana, one of the major partners in the PTP project. Last week, surveyors working on the pipeline were evicted from Wet'suwet'en territory by Hereditary Chief Toghestiy. The surveyors were issued an eagle feather, which in Wet'suwet'en law is used as a first and only notice of trespass. "Unist'ot'en and grassroots Wet'suwet'en have consistently stated that they will not allow such a pipeline to pass through their territory," said Chief Toghestiy in a press release. "The federal and provincial governments, as well as Indian Act tribal councils and bands, have no right or jurisdiction to approve development on Unist'ot'en lands." "Wetsuwet'en territory, which extends from just East of Burns Lake to the Coastal Mountain range, is sovereign and unceded territory," reads the letter. "The Wet'suwet'en are not under treaty with the Canadian government." Emergency rallies were held in Toronto and 12 other cities across Canada and the US today in a show of solidarity with the Unist'ot'en of Northern BC. 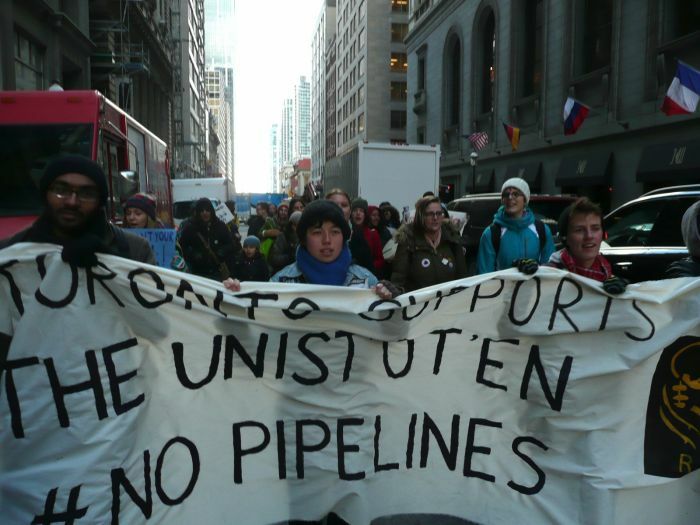 Sakura Saunders, one of the organizers of the Toronto rally and a member of Rising Tide Toronto, described the actions as "a show of strength of [Unist'ot'en] allies… to show the world they are supported." "The pipelines in BC have faced enormous resistance from indigenous and non-indigenous communities," says Saunders. "We are in solidarity with everyone who is trying to protect their lands from harm, and particularly with Indigenous communities who are also defending their sovereignty." "Under Wet'suwet'en law, the people of these lands have an inalienable right to their traditional territories, and the right to defend it," reads the letter. "Even by Canadian law, the Supreme Court Dalgamuukw case decision explicitly recognizes the authority of hereditary chiefs, not elected Indian Act bands or councils. "As such, any further unauthorized incursion into traditional Wet'suwet'en territory will be considered an act of colonialism, and an act of aggression towards our sovereignty," reads the letter. "[RBC and JFL] need to note that by investing in these pipelines they are violating the self-determination of Indigenous nations," says Saunders. "It is an act of colonization and they have no right to do so." "It's a bad investment," she adds, "Because [the pipeline] is not going to happen. There are very determined people that are going to ensure that it's not going to happen." According to Saunders, today's rallies are only the beginning of what PTP investors have to worry about.